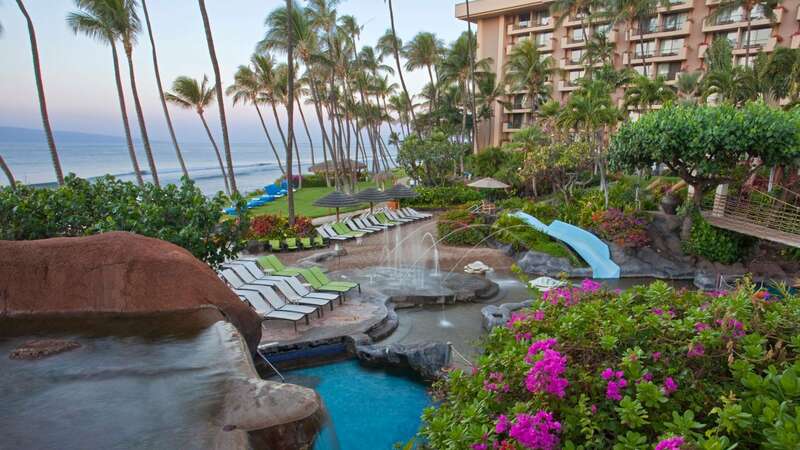 Soak up all Maui has to offer with a 5th Night Free and free daily buffet breakfast for two. Ka'anapali, one of the world's sunniest destinations, offers so much to do, you'll need an extra night to soak it all in! Spend your extra time exploring the Pacific Ocean, relaxing at the Marilyn Monroe Spa, perusing Lahaina Town's shops and galleries, or take off on a day trip to Lana'i, Hana, or up to Haleakala's crater for sunrise or sunset! Book Sunshine on Sale and get every 5th night free and daily breakfast buffet for two. Offer valid for reservations made in advance between 03/13/2018 and 12/26/2019 for stays from 03/14/2018 through 12/31/2019 at Hyatt Regency Maui Resort and Spa. Must request offer code SUN18 or SUN19 at time of booking to qualify for package, which includes: Breakfast Buffet for 2 Adults per day 5th Night Free per stay . Package inclusions are subject to availability and must coincide with guest’s stay at Hyatt Regency Maui Resort and Spa. No credits may be used towards alcoholic beverages. A limited number of rooms are allocated to this offer; reservations subject to availability. Offer not valid with groups, conventions, other promotional offers, tour packages or special rate programs. Rate is per room, per night, based on double occupancy and excludes service charges, mandatory resort fees, applicable taxes and other incidental expenses. Additional charges may apply for additional guests or room type upgrades. Guest is responsible for all charges not included in package. No refunds for any unused portion of package. No substitutions nor replacement services or products offered for package inclusions. A portion of the rate for this offer may reflect taxes, service charges, gratuities, and third-party charges for certain included items, and those costs are not eligible for Hyatt Gold Passport® points. Blackout dates: . Promotional blackout periods may apply due to seasonal periods or special events, and normal arrival/departure restrictions apply. Hyatt reserves the right to alter or withdraw this offer at any time without notice. The trademarks Hyatt®, Hyatt Hotels & Resorts®, Park Hyatt®, Grand Hyatt®, Hyatt Regency®, Andaz®, Hyatt Centric®, The Unbound Collection by Hyatt™, Hyatt Place®, Hyatt House®, Hyatt Ziva™, Hyatt Zilara™, World of Hyatt™, Hyatt Residence Club® and related marks are trademarks of Hyatt Corporation or its affiliates. ©2018 Hyatt Corporation. All rights reserved. Create lasting memories your family will never forget with the Ultimate Maui Family Vacation. Offer valid for reservations made 14 days in advance between 11/12/2018 and 12/14/2019 for stays from 11/20/2018 through 12/22/2019 at Hyatt Regency Maui Resort and Spa. Must request offer code UMF134 or UMF135 or UMF133 or UMF132 or UMF131 at time of booking to qualify for package, which includes: Breakfast Buffet per day Daily Self-Parking per day SUV Car Rental (pick up & Drop off at Kahului Airport) per stay Tour of the Stars Discount per stay. Package inclusions are subject to availability and must coincide with guest’s stay at Hyatt Regency Maui Resort and Spa. Package inclusions provided by third parties are subject to change and such third parties are solely responsible for the provision or performance of the package inclusions they provide. No credits may be used towards alcoholic beverages. A limited number of rooms are allocated to this offer; reservations subject to availability. Offer not valid with groups, conventions, other promotional offers, tour packages or special rate programs. Rate is per room, per night, based on double occupancy and excludes service charges, mandatory resort fees, applicable taxes and other incidental expenses. Additional charges may apply for additional guests or room type upgrades. Guest is responsible for all charges not included in package. No refunds for any unused portion of package. No substitutions nor replacement services or products offered for package inclusions. A portion of the rate for this offer may reflect taxes, service charges, gratuities, and third-party charges for certain included items, and those costs are not eligible for World of Hyatt® points. Promotional blackout periods may apply due to seasonal periods or special events, and normal arrival/departure restrictions apply. Hyatt reserves the right to alter or withdraw this offer at any time without notice. The trademarks Hyatt®, Hyatt Hotels & Resorts®, Park Hyatt®, Grand Hyatt®, Hyatt Regency®, Andaz®, Hyatt Centric®, The Unbound Collection by Hyatt™, Hyatt Place®, Hyatt House®, Hyatt Ziva™, Hyatt Zilara™, World of Hyatt™, Hyatt Residence Club® and related marks are trademarks of Hyatt Corporation or its affiliates. ©2018 Hyatt Corporation. All rights reserved. Offer valid for reservations made 14 in advance between 11/08/2018 and 12/07/2019 for stays from 11/16/2018 through 12/22/2019 at Hyatt Regency Maui Resort and Spa. Must request offer code LUV1 or LUV2 at time of booking to qualify for package, which includes: Car rental per stay $50 of Spa when spending $250 per stay Buffet Breakfast per day Self-Parking per day. Package inclusions are subject to availability and must coincide with guest’s stay at Hyatt Regency Maui Resort and Spa. Package inclusions provided by third parties are subject to change and such third parties are solely responsible for the provision or performance of the package inclusions they provide. No credits may be used towards alcoholic beverages. A limited number of rooms are allocated to this offer; reservations subject to availability. Offer not valid with groups, conventions, other promotional offers, tour packages or special rate programs. Rate is per room, per night, based on double occupancy and excludes service charges, mandatory resort fees, applicable taxes and other incidental expenses. Additional charges may apply for additional guests or room type upgrades. Guest is responsible for all charges not included in package. No refunds for any unused portion of package. No substitutions nor replacement services or products offered for package inclusions. A portion of the rate for this offer may reflect taxes, service charges, gratuities, and third-party charges for certain included items, and those costs are not eligible for World of Hyatt® points. Promotional blackout periods may apply due to seasonal periods or special events, and normal arrival/departure restrictions apply. Hyatt reserves the right to alter or withdraw this offer at any time without notice. The trademarks Hyatt®, Hyatt Hotels & Resorts®, Park Hyatt®, Grand Hyatt®, Hyatt Regency®, Andaz®, Hyatt Centric®, The Unbound Collection by Hyatt™, Hyatt Place®, Hyatt House®, Hyatt Ziva™, Hyatt Zilara™, World of Hyatt™, Hyatt Residence Club® and related marks are trademarks of Hyatt Corporation or its affiliates. ©2018 Hyatt Corporation. All rights reserved. Daily Breakfast for two: (2) rounds of golf daily at Ka’anapali Kai Golf Course: Tax excluded –Buffet breakfast each morning is valid at Swan Court Breakfast Buffet – Gratuity not included. Breakfast NOT valid for in room dining – Valid 7 days a week. One sleeve of Golf balls provided on arrival. Daily golf club rental included. Offer valid for reservations made 7 in advance between 06/07/2018 and 12/12/2019 for stays from 06/16/2018 through 12/19/2019 at Hyatt Regency Maui Resort and Spa. Must request offer code GOLF2 at time of booking to qualify for package, which includes: 2 rounds of golf at Kaanapali Kai Golf Course per day Breakfast buffet for 2 adults in Swan Court per day, Gratuity not included, One sleeve of golf balls per stay Golf Club Rentals per day. Package inclusions are subject to availability and must coincide with guest’s stay at Hyatt Regency Maui Resort and Spa. Package inclusions provided by third parties are subject to change and such third parties are solely responsible for the provision or performance of the package inclusions they provide. No credits may be used towards alcoholic beverages. A limited number of rooms are allocated to this offer; reservations subject to availability. Offer not valid with groups, conventions, other promotional offers, tour packages or special rate programs. Rate is per room, per night, based on double occupancy and excludes service charges, mandatory resort fees, applicable taxes and other incidental expenses. Additional charges may apply for additional guests or room type upgrades. Guest is responsible for all charges not included in package. No refunds for any unused portion of package. No substitutions nor replacement services or products offered for package inclusions. A portion of the rate for this offer may reflect taxes, service charges, gratuities, and third-party charges for certain included items, and those costs are not eligible for Hyatt Gold Passport® points. Blackout dates: .